Home / Amazon / How do you fight hate as a mom? How do you fight hate as a mom? 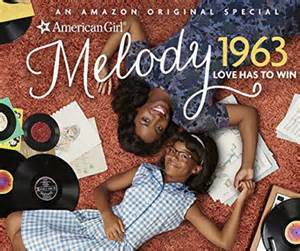 Tonight I had the privilege to watch an amazing show called An American Girl Story – Melody 1963: Love Has to Win, it is all about a little girl and her life in 1963 in Chicago. Of course, many of us are aware there was a lot going on in the world at that time around black people and what they were allowed to do and not do. Overall, the show made me incredibly sad, but I was so inspired by Melody’s mother. She continued to do what she needed to do in her life to make things better for her daughter and her community. She knew what was important in life and that was love. I am so inspired as a mom from this show, and I feel like in the environment today we need to remember that no matter what, love is what matters in life. Without love, all you can feel is fear and that is no way to live. I have tried my whole life to always accept people for who they are. I never wanted to change them into what I wanted them to be, it was important to listen, learn from them, and find out all about them. I have learned more by listening and watching than I ever have from talking. Being a foster mom for a while, I had placements of all races and nationalities I never told a social worker not to bring me a child because of their race. I wanted my kids to know they all were accepted. In MY house they are all accepted no matter what. I will continue to work toward that goal for my community, my city, and eventually my world. If everyone could fight fear with love as Melody’s mom did in the show, we could get so much farther in this world. Many times people have been different from me, but, I will say that when they hug you it still feels warm and squishy and loved, that is the important part, we all love and we all hurt. I am feeling so encouraged and inspired to try to go out of my way and continue to show my kids adopted and biological, how much love can make a difference to someone. This holiday season we are going to find someway to love someone in a way they never expect, regardless of what they look like! Check out Melody’s story here! What would you like to do show people around you that love matters more? Previous post: Celebrate National Mutt Day with Peppy Pup!